FISH BITE!…except when they dont! 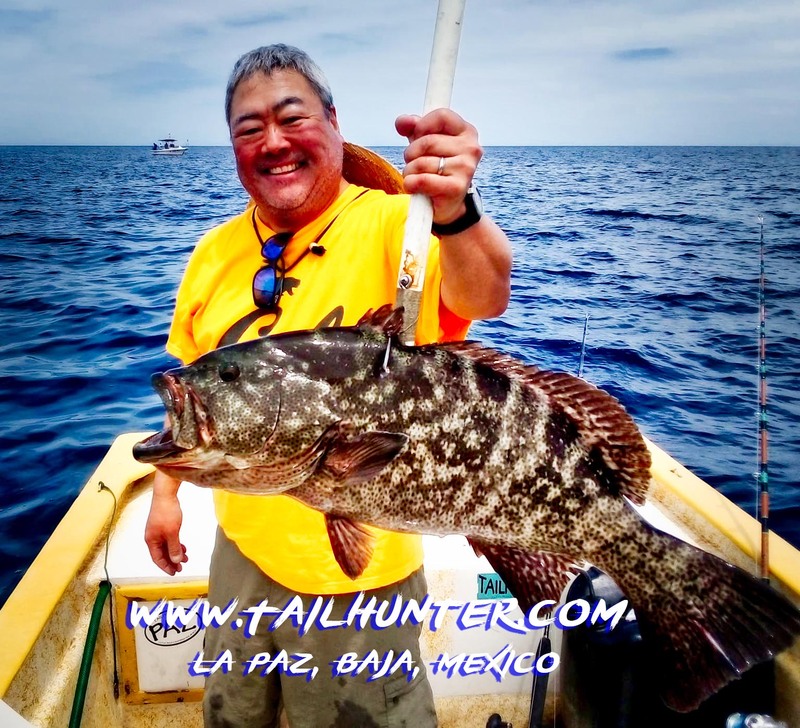 Paul Nagata from San Francisco makes at least 1 trip a year with Tailhunter in La Paz. 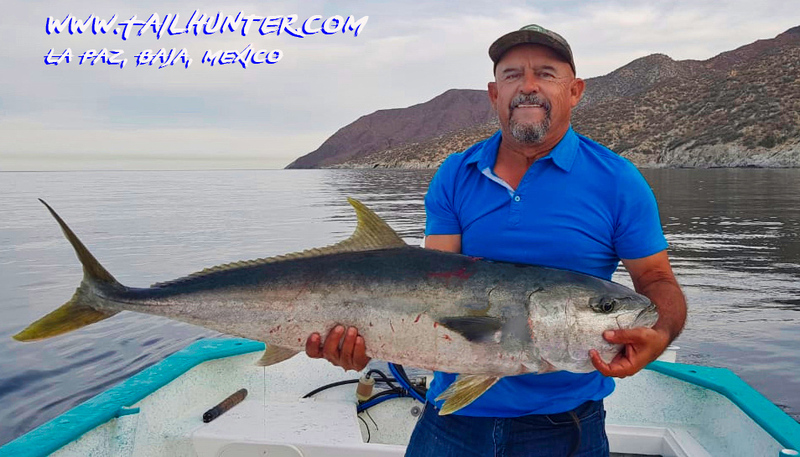 He was fishing off the south end of Cerralvo Island with Captain Pancho of the Tailhunter Fleet in an area that had been producing some yellowtail in the shallow bank at South Point. Not having much luck on live bait, they decided to make one more drift over the spot although it was already late in the afternoon. 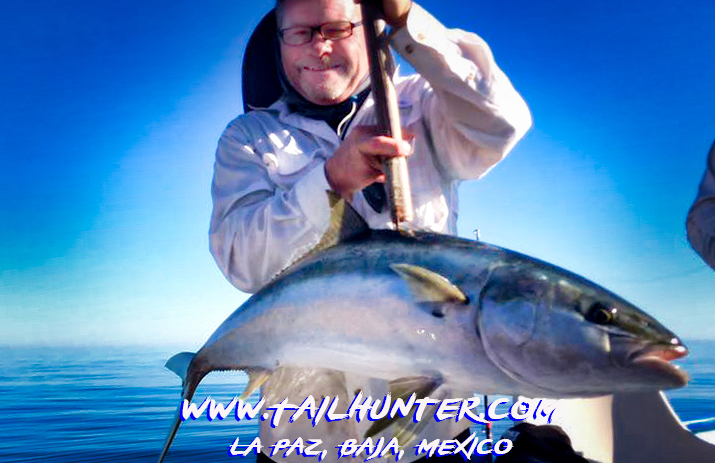 The big tuna bit and towed the panga for 2 hours on 50-pound test, but a very light rod! Paul and Captain Pancho handed the rod back-and-forth every 20 minutes. Big fish in the rocks! Even Pancho got to pull on some fish this week. A solid cabrilla going onto the grill. Paul had quite a week taking 8 different species of fish including this trophy cabrilla over the reef . Variety on the cutting table! 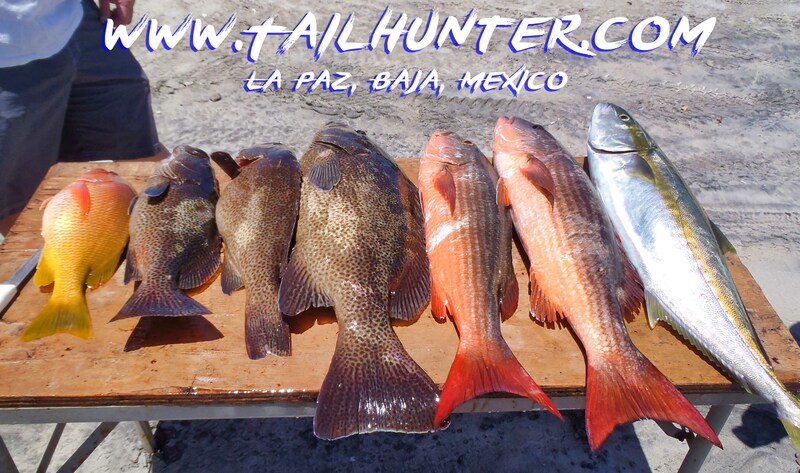 Cabrilla, pargo liso and snapper! We had a schitzophrenic Easter Week of weather and fishing. Although the sun was out, we had 4 days of windy rough conditions and 3 days that were reasonably fishable. Consequently, the fishing reports reflected the conditions. 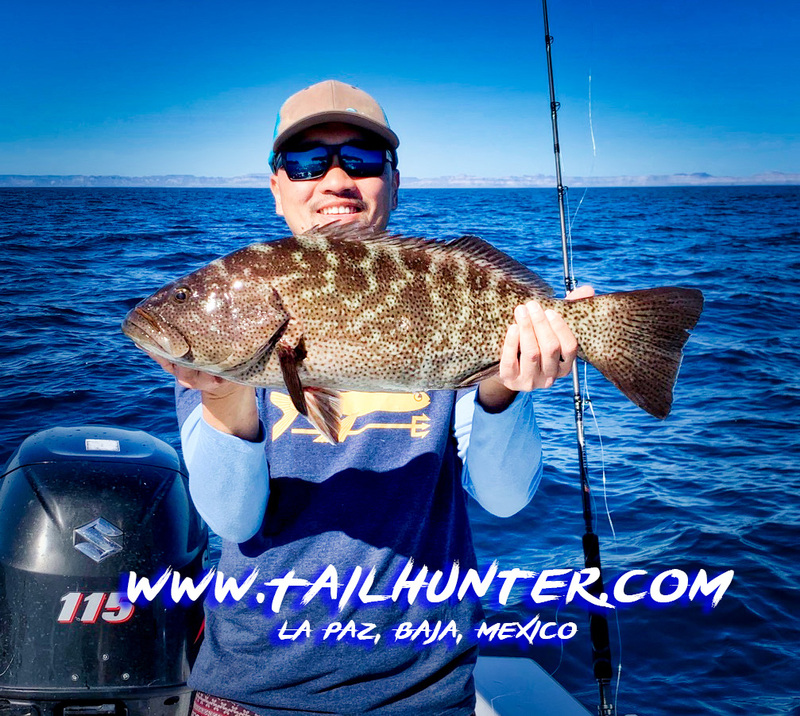 The days when the weather smiled, we had some banner fishing with lots of variety that included some fantastic inshore fishing including trophy-sized cabrilla and pargo ( big mullet snapper and barred pargo) as well as yellowtail, yellow snapper, several species of bonito and jack crevalle. Most caught either with live bait or slow trolling Rapalas over the rocky shallow areas close to shore. Typical catch this week…yellowtail…pargo liso (mullet snapper)…cabrilla…yellow snapper. All tough fighting fish inshore on the rocks. 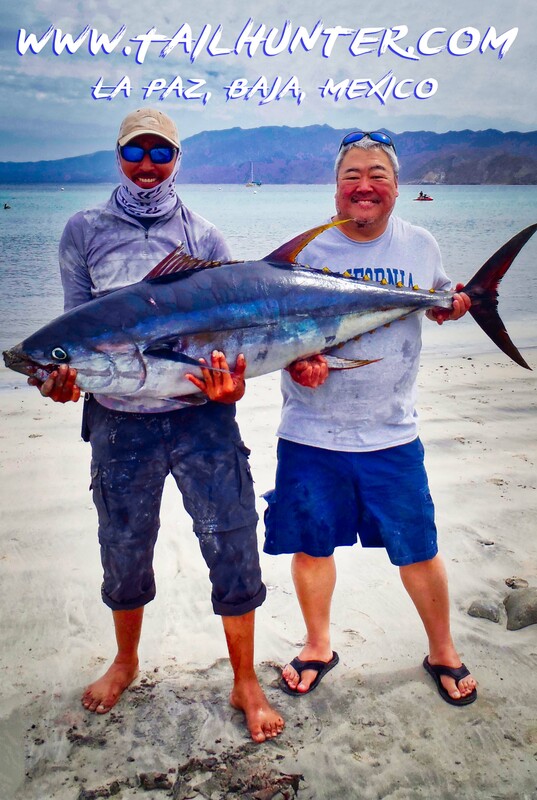 Additionally, blue water species like dorado and wahoo also bit and one of our anglers nailed a big 108-pound yellowfin tuna (he had a scale) on a caballito that he fought for 2 hours. On the days when the winds slammed, we were reduced to trolling because bait was impossible to obtain. Winds also prevented us from getting to some of the hotter fishing spots. This coming week looks a little more promising. We have alot more folks fishing this week as more anglers start coming into town and the season opens up. Will hopefully have more and better photos in the next report! Hope Easter was great for you and your family. Now this is a yellowtail! Just off Espirito Santo Island, Desmond Sjaufoekloy took this hefty beast earlier in the week. Cabrilla like this tasty trophy are on the chew right now in the rocky areas. Jeff Brown poses with a beauty. Desmond took this fat cabrilla to dinner at our Tailhunter Restaurant. Captain Joel with Rod Brown and a nice mix of yellowtail, barred pargo and snapper. Just when we were getting all comfortable and figured winter was done with us, I had a feeling she still had a few gusts left in her. Sure enough, like “Game or Thrones” winter came back to remind us we’re not quite out’ve range yet. The week started out sort or OK. But we could tell it was going to ramp up again. 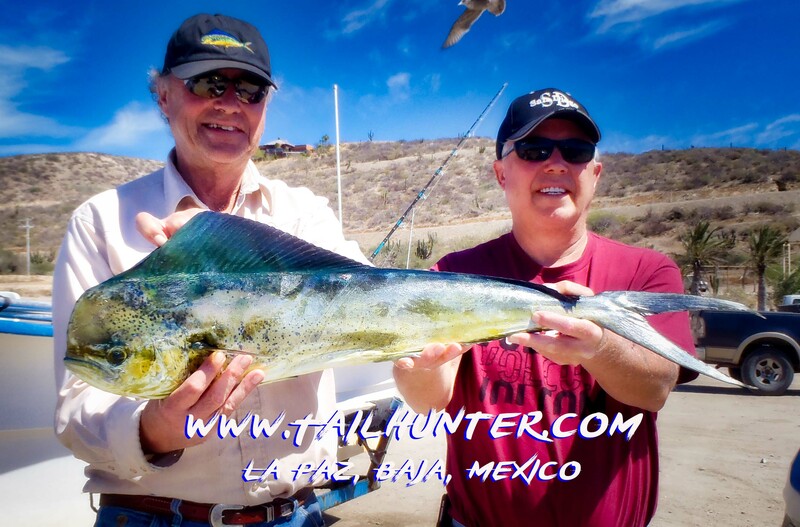 Our folks got a nice mix of fish including yellowtail, some big fat cabrilla and other species plus a smattering of dorado. 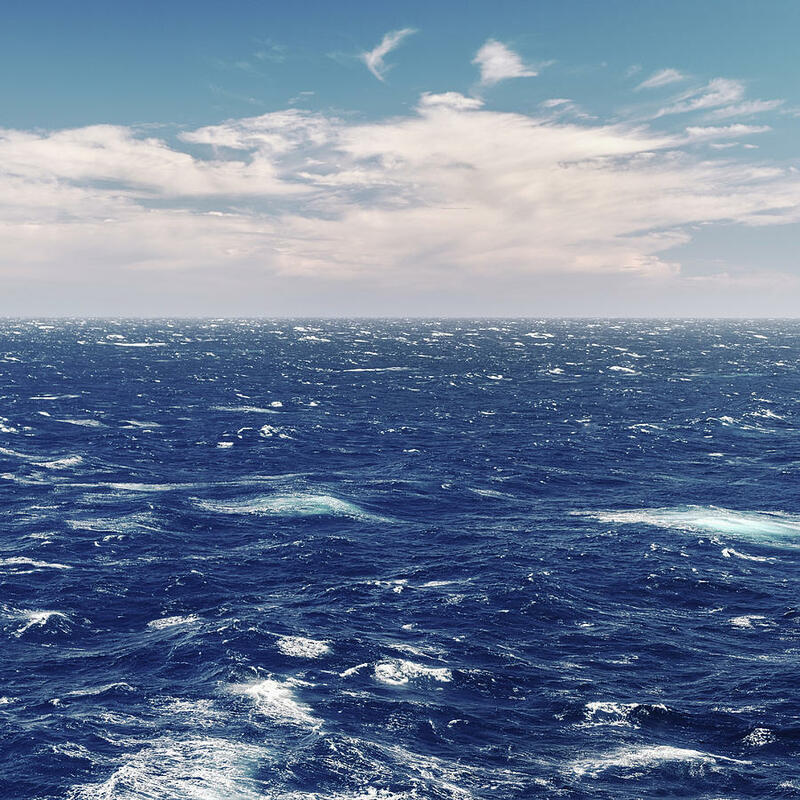 But, with each day, the winds got stronger. Towards the latter part of the week, it was not just gusting, it was ripping and even the La Paz Port Captain shut down all boat traffic. No fishing…diving…swimming with whale sharks…no boats coming in and out. And, I get it. Can’t blame him. It was blowing white caps even in the bay, even with the sun out. Better to err on the side of safety. Heck, even on the “calmer” days our folks were getting bounced and wet. It did calm down just a tad by the end of the week, but not much and about the only thing we could raise in the rough water was bonito. The coming week, it looks a little better. Fingers crossed. That’s our story! Happy Easter everyone. Have a safe and blessed holidays. CRAZY VARIETY FOR 2nd STRAIGHT WEEK! Micah Pettit from Utah came down with his dad for his first trip with us although dad fishes with us several times a year. Micah stuck it to this tough yellowtail just outside Bahia Muertos his first day along with snapper, cabrilla and sierra. Our amigo, Rod Brown from Alaska has been coming to fish with us for over a dozen years and usually during the spring . 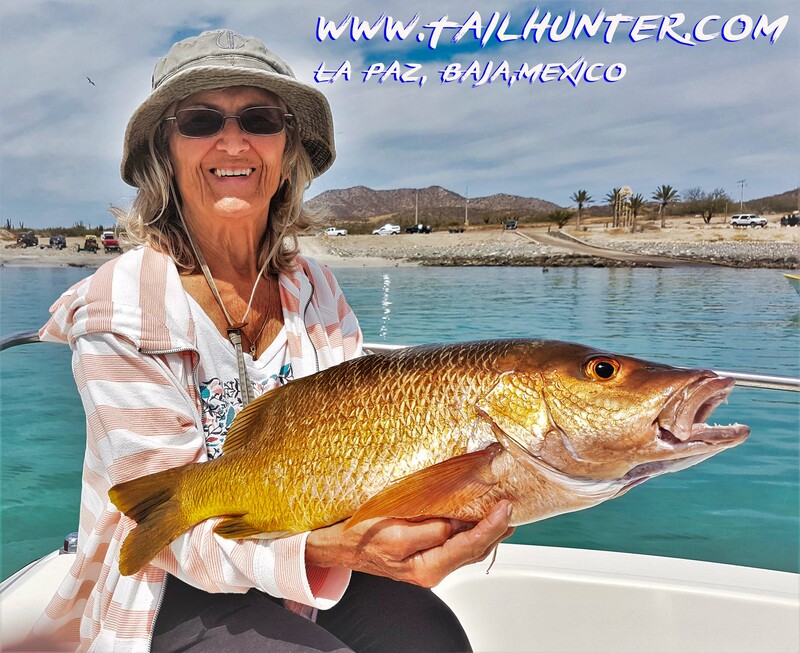 Along with nice yellowtail, he put this trophy barred pargo in the box fishing around Espirito Santo Island north of La Paz over the rocks. From Minnesota, Jeff Brown is a pretty good fisherman on our La Paz waters and always does well as he poses with one of his nice yellowtail. This type of rack of fish is not unusual this time of year when we can end up with alot of variety. 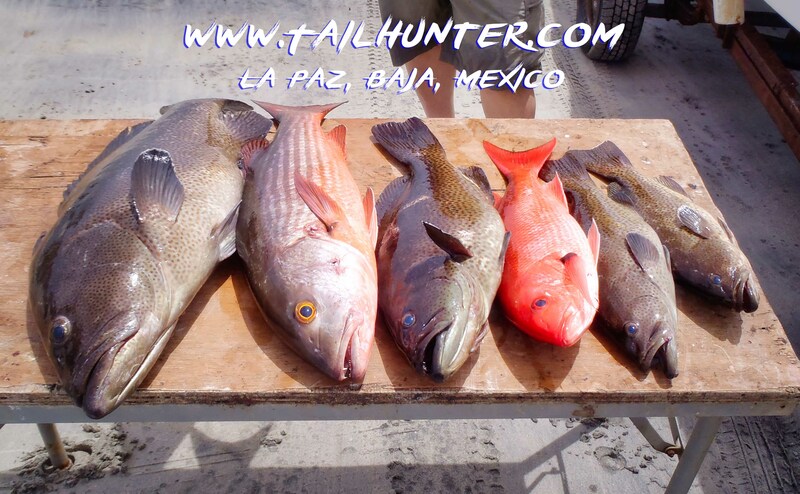 Here you see yellowtail, yellow snapper, sierra, cabrilla and barred pargo. Our popular Captain Joel has reason to smile after putting the gaff to Jeff’s trophy barred pargo. That’s Espirito Santo Island in the background. Coleman Wadsworth shows off his catch including this yellowtail plus some great eating variety on the boar behind him including rockfish like snapper, cabrilla and pargo. Incredible variety this week as we hit a 2nd good week of action. It’s what we call “transitional” time although it usually doesn’t hit until about next month. However, it’s the time of the fishing season when it’s not winter anymore and not summer quite yet in the water. Consequently, you still have the ability to catch cold-water species like cabrilla, pargo, sierra, yellowtail, amberjack, snapper and more as they still linger. However, warm water species like dorado, tuna, wahoo, billfish, larger roosterfish are no starting to move in as well as surface waters warm. Add in bonito, jack crevalle, skipjack and other year-round species and you get a lot of variety right now and that’s the kind of week we just had with great action on a number of different kinds of fish. You may not get a lot of any one species, but you could finish a day with 6, 8, 10 or more different species in the box at the end of the day. The boat right next to you have have another 3 or 4 different species. The next day you get completely different species. It makes for some fun fishing. Still not a lot of anglers out on the water, but the ones we did have out took yellowtail, barred pargo, dog-tooth snapper, sierra, amberjack, bonito, jack crevalle, roosterfish (released), yellow snapper, cabrilla as well as tuna (lost) and wahoo (lost). Signs of striped marlin were also seen. Biggest problem is that many of the fish are in shallow water right now or over structure so lots of big fish are getting lost in the rocks but they’re willng to bite. Despite the great fishing this week, don’t say good-bye just yet to those windy days of winter…Sunday was pretty rough and blustery again. Will keep an eye out for you. Stay tuned. We were able to send out our first anglers of the season over to the Pacific side to light-tackle fish the mangroves in the shallows of Bahia Magdalena and they had a spectacular time. Using live bait, they had 50-60 fish days catching, releasing and donating much of their catch and also losing many fish in the tangles of roots and underwater structure. Catches included: snook, cabrilla, spotted-bay bass, halibut, snapper, pargo, corvina, croaker, and many more! That’s ALOT of variety and light tackle action after just one day fishing the mangrove shallows in Bahia Magdalena not including all the other fish lost and donated. Rod Brown with a tasty snook. Those are the barrier dunes on the edge of Mag Bay behind him. 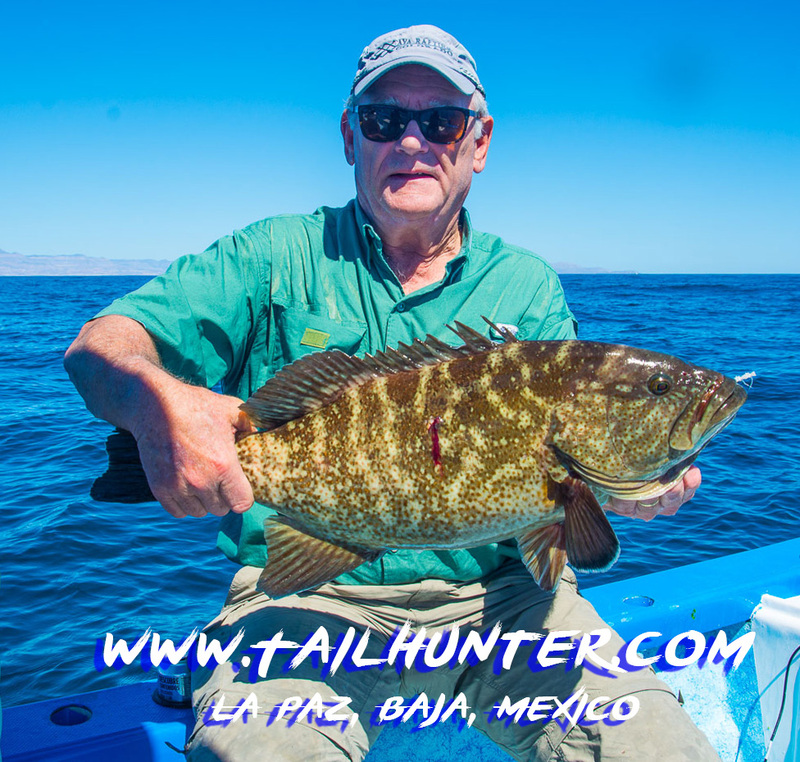 Called “lenguado” (tonguefish) in Spanish, Jorge Romero has himself a good little halibut that ate a live sardine. You can see the tangle of mangrove roots behind Jeff Brown and how close to shore we fish in the shallows of Mag Bay, but check out the kind of fish lurking in the roots like this pargo. IS WINTER FINALLY FINISHED WITH US? 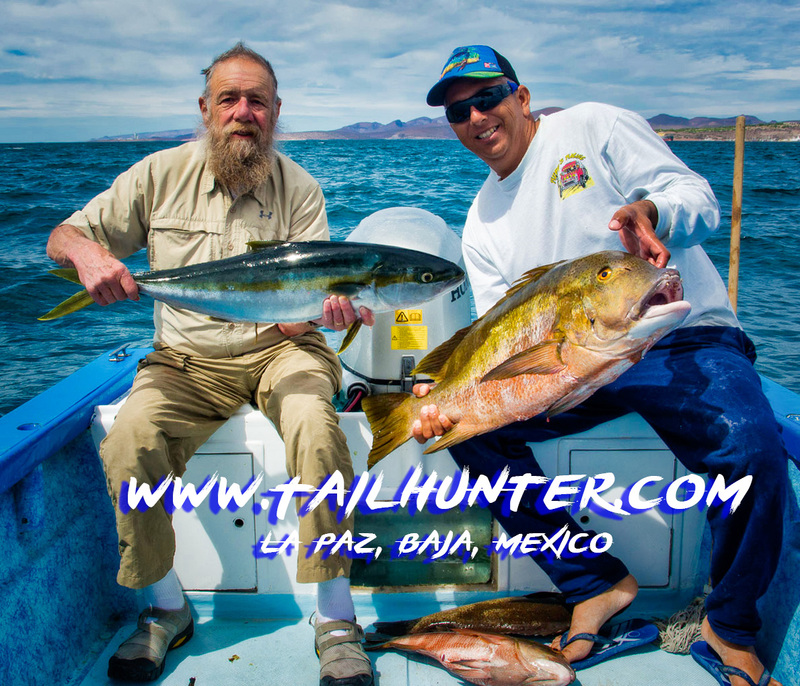 Fishing brother Rod Brown from Alaska and Jeff Brown from Minnesota get together once a year in La Paz to fish with us and scored limits of yellowtail and other species fishing north of La Paz near Espirito Santo Island. Gary Wagner, owner of Rancho Costa, rocked this big thick yellowtail on the north end of Cerralvo island on the east side with a live mackerel. That’s a trophy! Big tasty cabrilla headed no doubt for the dinner table caught by Miles Wagner from Colorado Springs CO.
Our own Captain Joel has a big smile posing with Jeff Brown and some of the limits of yellowtail they caught and lost many others in the rocks. Yes! Roosterfish are starting to show up! 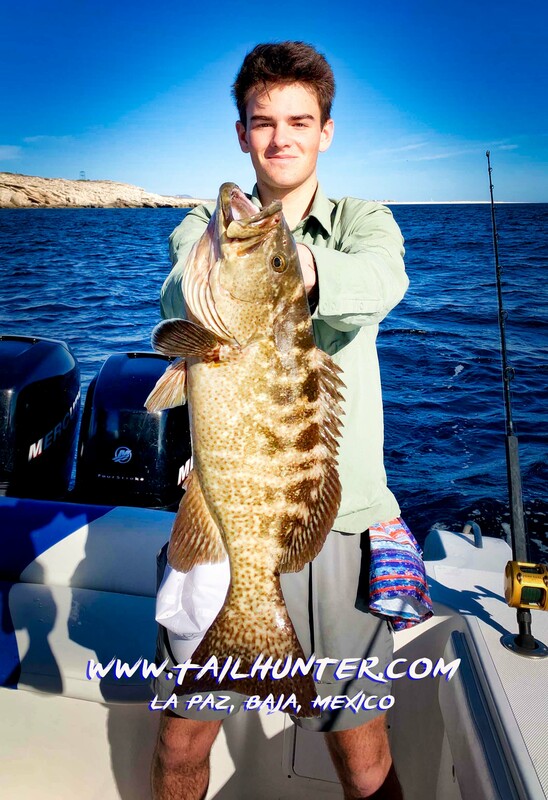 Right there in Muertos Bay, Miles was working live sardines on light tackle and had a blast catching and releasing these smaller early-season roosters. The big boys should be close behind! Nothing better than light tackle fishing and big fish. Check out this pretty cabrilla that Russ Whitmarsh nailed on a bass rod just close to the rocks where these guys hang out. Nice catch! What a difference a week or two makes! We’ve gone from some of the harshest and toughest winter fishing in a long time several weeks ago to some of the nicest conditions and fishing so far this season. Still not completely up-to-speed and I’d be crazy to say we’re completely done with winter and the pesky winds, but this past week was sure a nice time to be on the water. With the first true week of springtime and temperatures in the high 80’s to low 90’s. the winds weren’t completely done with us and there were some episodes for several days, but overall, Mother Nature was good to our fishermen for once. 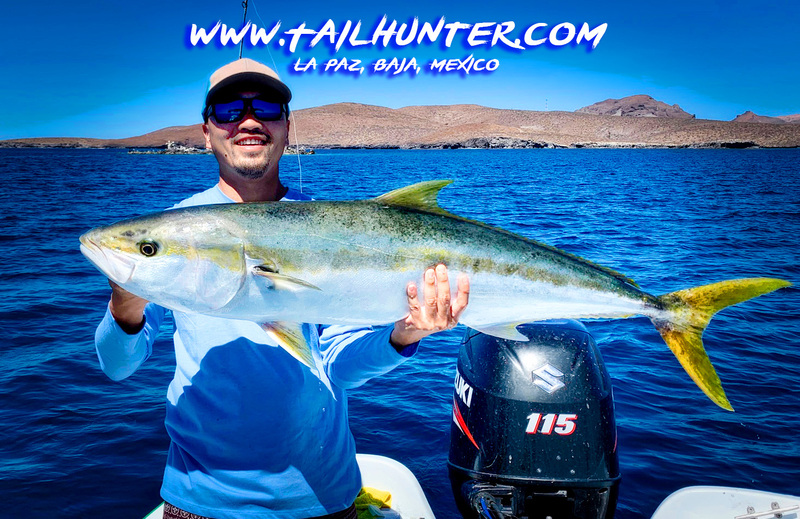 With some perfect candy-sized mackerel for baits for both our Tailhunter La Paz and Las Arenas fleet, the big story were the yellowtail. They popped up in several places including the upper east-side of Cerralvo Island; south point of Cerralvo and Punta Perrico. 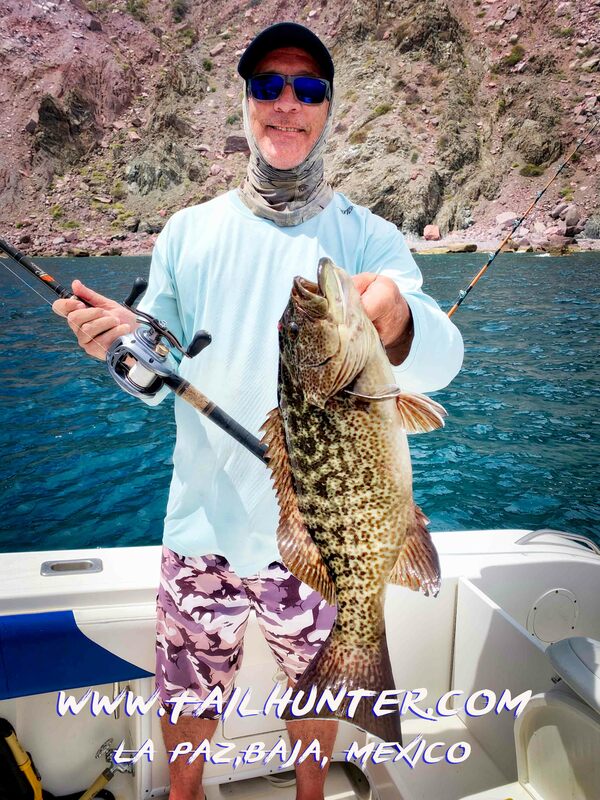 We also had quite a bite going around the high spots around Espirito Santo Island. Most of the fish weren’t huge, but that’s because so many of the fish were hovering and feeding in shallow waters close to the rocks, shore or over structure. Lots of the bigger 30-40 pound mossbacks threw hooks or broke lines in the rocks plus quite a few missed bites! But the ones that were landed were respectable powerful 20-25 pound fish. 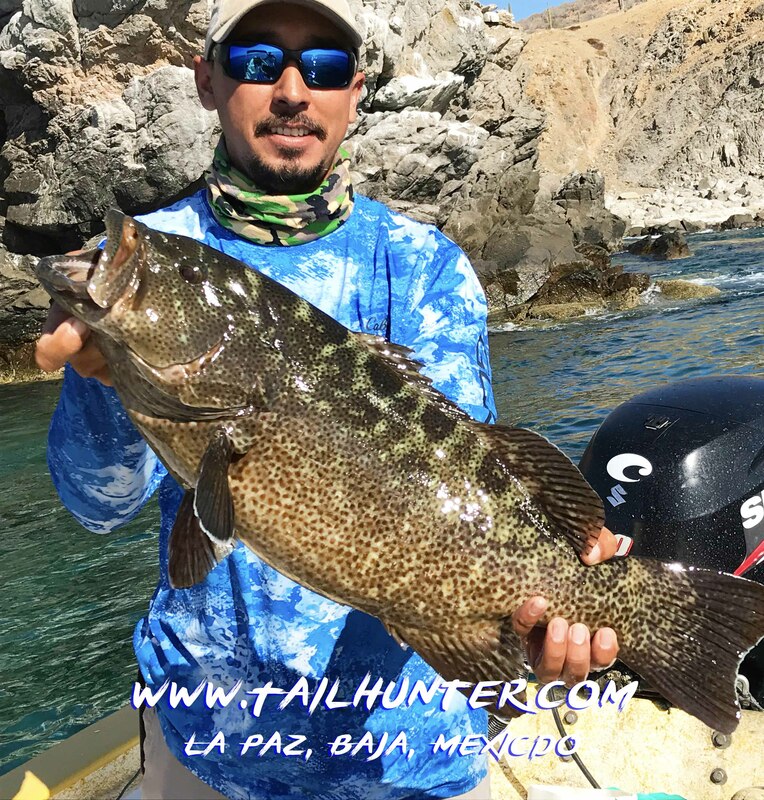 Not to be completely outdone, we also had some incredible cabrilla fishing tight inside to the cliffs and rocks with some trophy-sized fish being landed on bait, jigs and slow-trolled Rapalas and YoZuris as well as pargo and assorted rockfish. We also saw action on lots of bonito on light tackle, jack crevalle and even some early season roosterfish! All-in-all some solid biters and some of the best variety of the young season! Well, we finally came to the end of another awesome road trip. Our 25th year going from one show to the other. This year 12 states and 11 incredible shows meeting and talking to so many awesome folks and old friends! 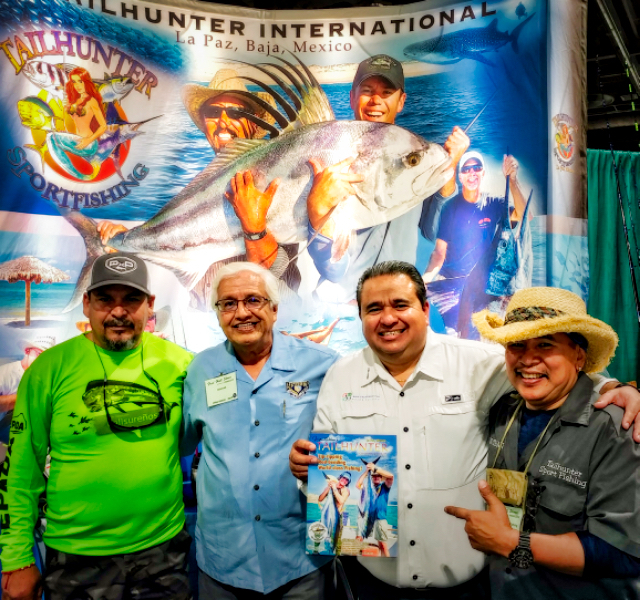 Thanks to everyone who came by to chat and all the hospitality and also all of you who booked with us to fish in La Paz with us in 2019. We’re are ready to fish! Bring it on. We still have some spots open so get in touch with us, but judging from our bookings this year, we’re gonna have a bang-up year! SPRING BRINGS A WELCOME CHANGE! 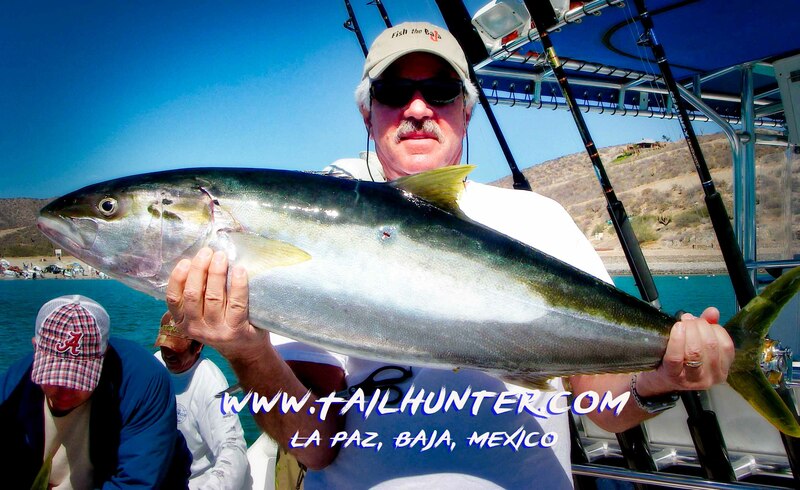 Skip Coomber from San Diego has a handful of hefty yellowtail. He and his family landed 5 between 20-30 pounds and busted off 3. He said one spooled him on 40 pound test. The fish were taking live bait off Cerralvo Island. 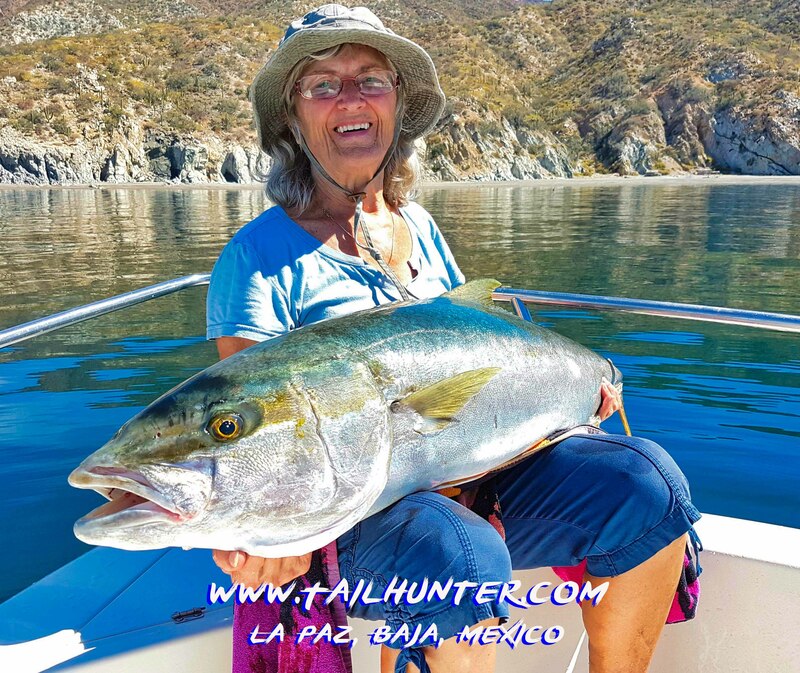 On the backside of Cerralvo Island where Captain Victor found calm waters, Erika and Carolyn landed several nice yellowtail like these in the shallow waters. He’s just called “Joel the Bald Guy” by his amigos, but he gets the last grin with ah thick yellowtail and a handful of great eating . These fish were crashing on the surface over the rocky areas. 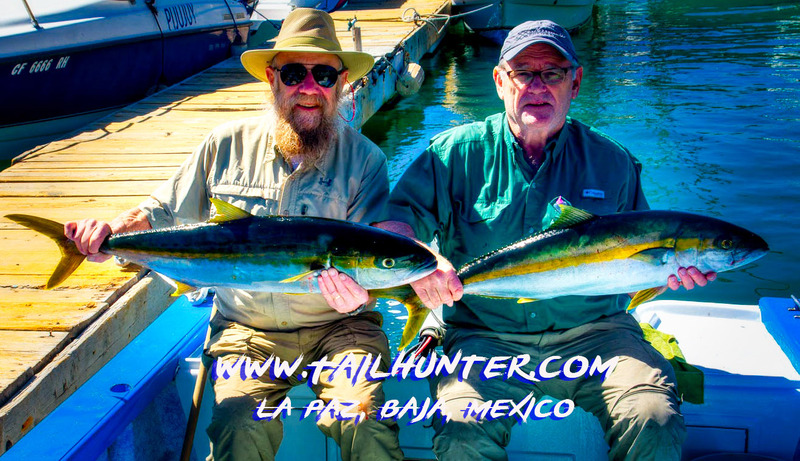 Amigo Bob Sayre, from Chicago, was just out in front of the hotels not far from shore when he ran into some pretty fun dorado taking 5 on dead bait and losing 2. Not like the fish to be here so early in the year…nor right there in the bay! You can see how close to the shore they are. 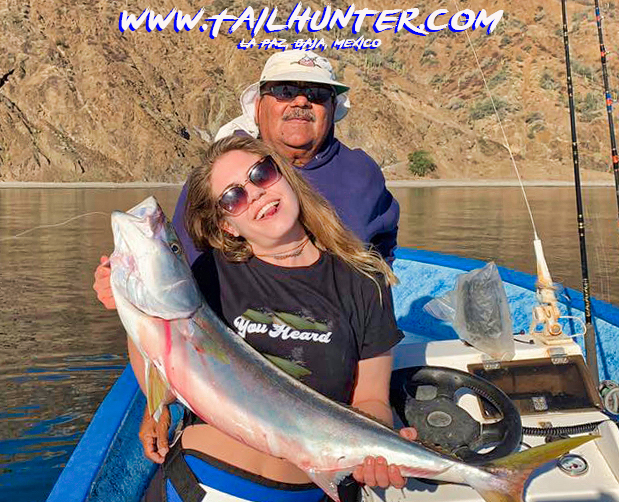 Captain Victor and a happy Caroline Coomber and another yellowtail! Hard-charging jack crevalle for Erika. There’s a reason the Mexican name for these guys is “Toro” (Bull). It’s nice to have something substantive to tell you this time after last week’s report! Even photos and better video! We definitely had a better week of fishing which happened to co-incide with better weather finally as spring arrived with some surprising catches. Maybe the fish woke up for spring! 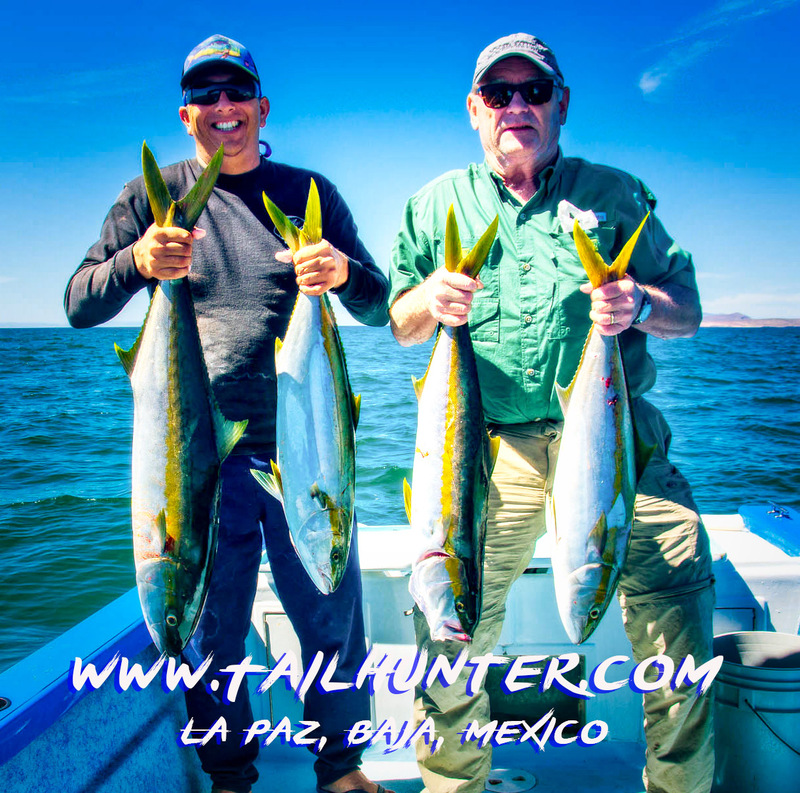 Early in the week, waters really settled down nicely and some nice quality yellowtail came to chew and seemed to pop up in several places. These 20-30 pound forkies were hitting live bait, jigs and dead bait on the back side of Cerralvo Island, just outside of Bahia Muertos (Suenos); Punta Perrico; as well as Espirito Santo Island. Quite a few fish, including bigger ones were lost in the rocks insofar as many of these fish were biting in shallow water either right off the rocks or over shallow structure and reefs. 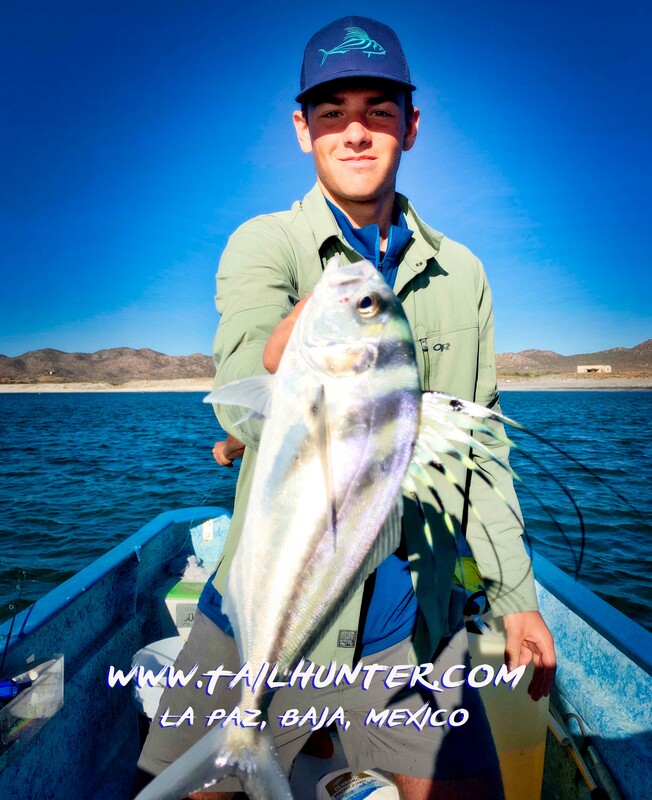 The same areas produced jack crevalle, small roosters, bonito, pargo and cabrilla. A wahoo was lost as well! The surprising catches were right in the Bay of La Paz. Pretty much right out in front of the hotels and Malecon waterfront. 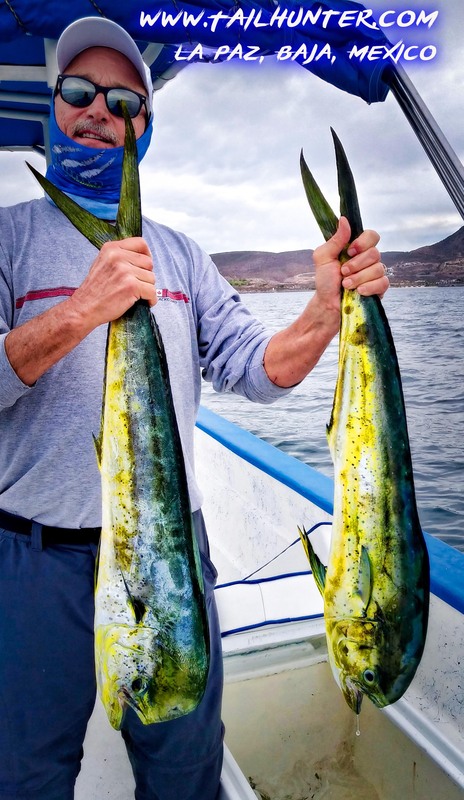 Fun, 10-15 pound schools of dorado showed up literally just a few hundred yards out front in shallow water. It might have something to do with the patches of floating sargasso weed that moved in which we usually don’t see until about May or so when waters warm. The sargasso draws baitfish which hide in the weeds as well as flying fish that lay eggs in the floating paddies. This draws the dorado in searching for food. A good sign of an early season! Fingers crossed. It’s been a brutal winter up north as well as in Baja and I have a feeling that winter isn’t quite done with us just yet! 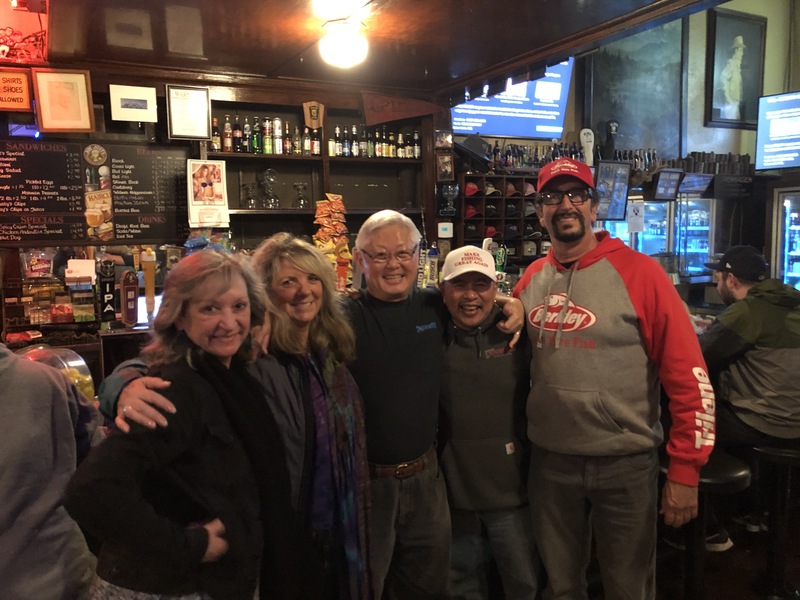 Our 2019 Show Tour comes to an end! 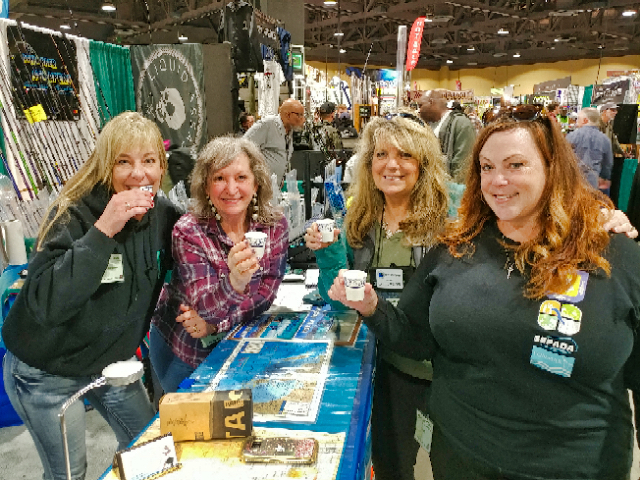 After almost 4 months on the road driving to the most awesome fishing/ hunting expos in the west and hauling our booth back and forth across the country through one of the most crazy winters ever, we come to our last show…and it’s a good one! Denver show to Sacramento…then to Puyallup (Seattle)…then to Portland…and Salt Lake City…then Boise…after which we hit the Fred Hall Show in Long Beach…then Bakersfield and back to Salt Lake City again. Then just finishing up a great show in Scottsdale AZ. Back and forth and up and down, what a fantastic country we have and are blessed to visit every year! Thank you all and for those of you who booked with us, we’ll do our best to have the fish and sunshine waiting for you! 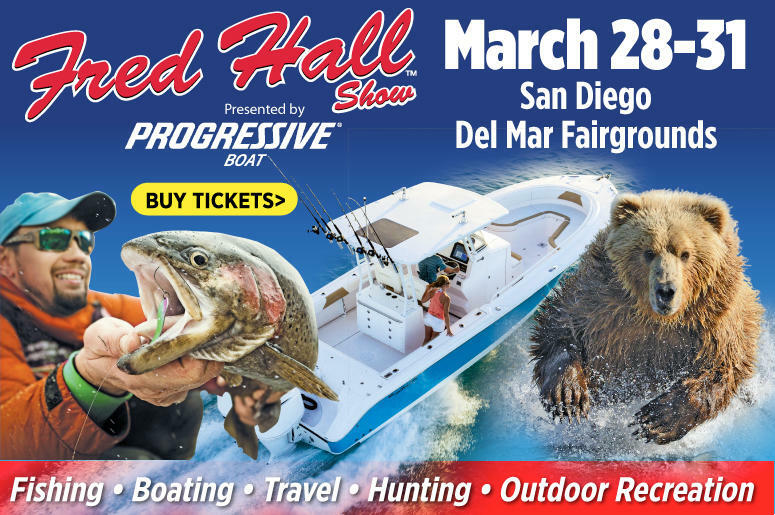 Now, we head to the beaches of San Diego for the Fred Hall Fishing and Boating Show at the Del Mar Fairgrounds just north of the city. 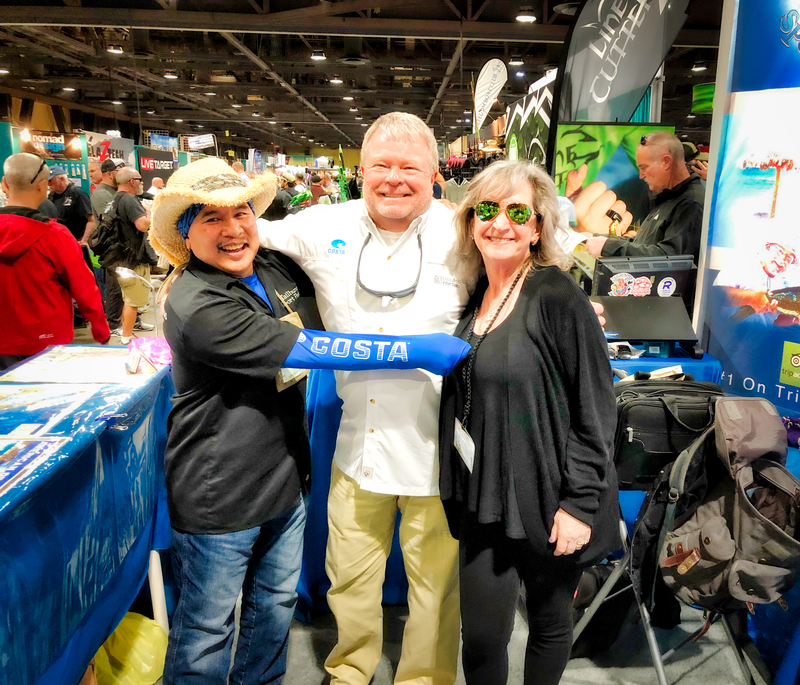 This is a fun show and all our friends are there and it’s a big party with lots to see and do for the whole family about fishing, hunting, camping, boating, and so much more. The show runs Thursday to Sunday and we’ll see you there. Here’s more info. Click the link! This is gonna be short. I’ve been doing this report for over 20 years every single weekend. And I’ve only missed something like 6 weeks the whole time. And you know I always tell it straight up…good…bad…or otherwise. Well, I guess I could make something up but, that’s not how I roll. So, here it is. (drumroll…) Nothing to report. 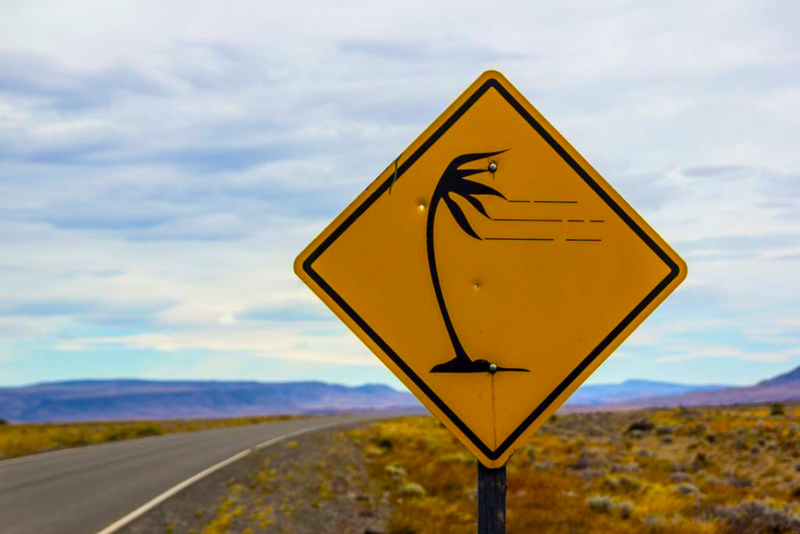 While the rest of the country was getting “winterized” again for the umpteenth time this season, the winds blew again in La Paz which isn’t surprising. That’s why November to April is called “off-season” and why so many windsurfers and kite-boarders descend on the area from all over the world during these months. Cuz it’s WINDY! There was even a bit of rain one day early in the week. And why not many people fishing. We did have some folks request to go out, but the days they wanted to go out, I advised them not to. I told ’em, I’d love to take their money, but that they’d be wasting their time and it would be best just to hang out and not go out and get bounced around and get wet. Not much fun in that. I want everyone to have a good time. On the 2 days that looked fishable, no one asked to go out. I think they would have gotten some fish. Oh well. I did hear there were some dorado right in the bay. And there were some bonito out as well, but that was about it. Just not many folks out. Jilly and I were split apart this past weekend. Each of us at a different show. I was there at the ISE SHOW in Sandy UT, just south of Salt Lake and it was great to see so many amigos and meet new ones. Thanks for everyone who came by and also for all the kind gifts as well! 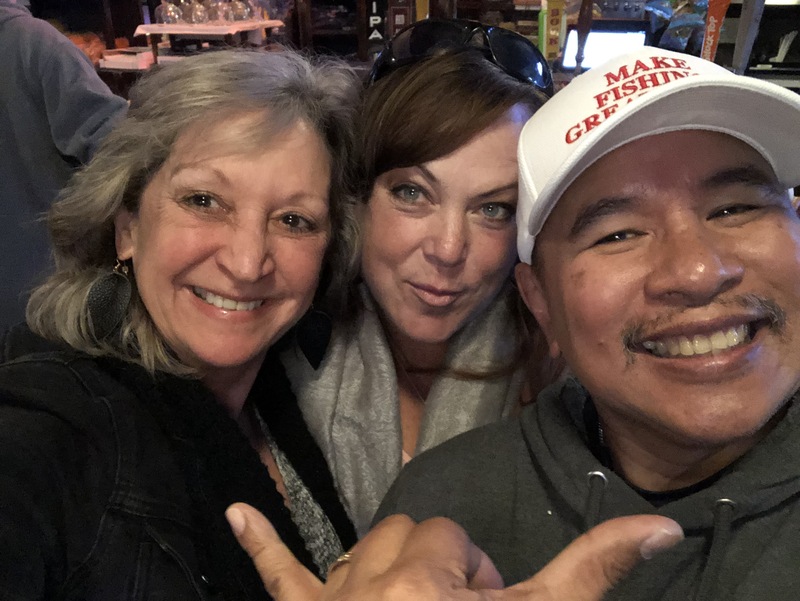 Jilly wrapped up the Fred Hall Show in Bakersfield. It was her first time doing that show by herself and we appreciate everyone who looked in on her and stopped to chat. But now, onto Scottsdale, Arizona. I pick up Jilly in Las Vegas and we’ll drive south to the ISE Show that starts Thursday and runs to Sunday. It’s at the Westworld facility there in Scottsdale. After that…last show of the season and 3 months on the road will be at the Del Mar Fairgrounds in San Diego. Hope to see you down the road! 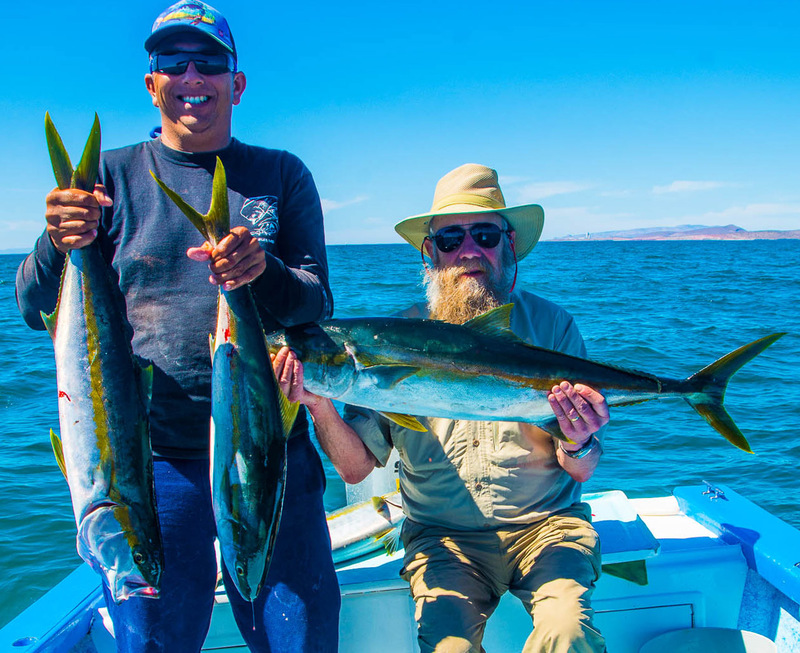 Early in the week hogs like Carl Lange’s hefty yellowtail were hanging in the shallow waters willing to take the baits, but as the week went on the fish got harder to find. From Paso Robles, Joel Zarmati was fishing live bait over shallow rocks on the lee side of Cerralvo Island where the waters were calmer and sheltered from the winds when he hooked and landed this big-headed yellowtail. A little early in the season for warm-water dorado, but nonetheless, Al Hutchinson brought this one back to the beach for the dinner table. Tasty huachinango/ dog-tooth snapper right there in Bahia Muertos by our amiga, Donna Thompson. These guys can grow well over 50 or 60 pounds. 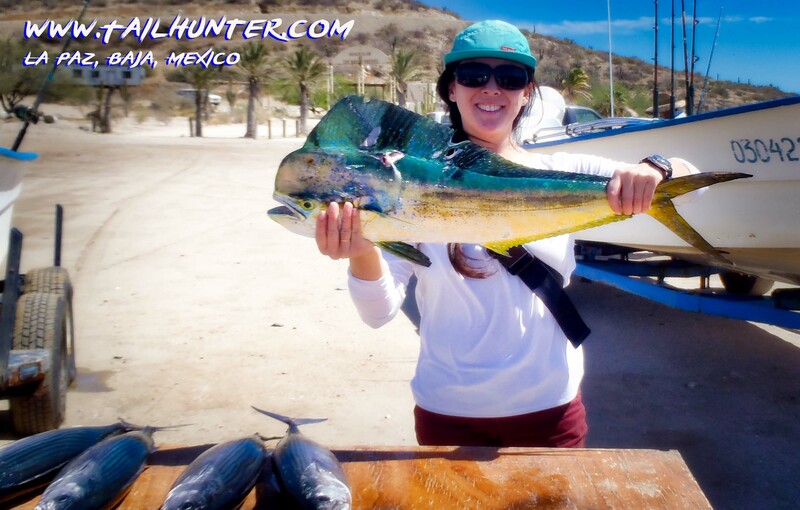 Lots of action for Kyra Sacadan who shows off her dorado and a table full of white bonito. Great photo! Great fish! Donna can fish! 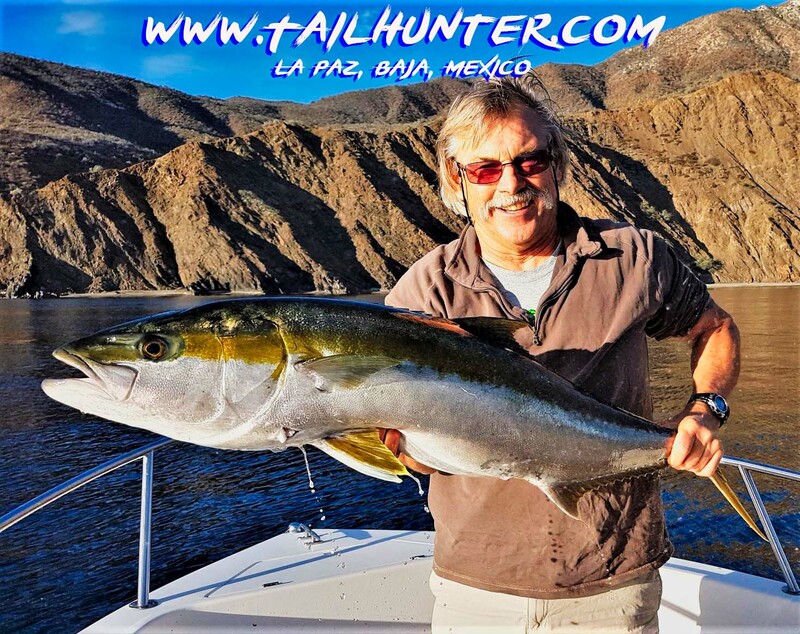 Check out the size and colors of this trophy yellowtail off Cerralvo Island. It was a hit-or-miss kind of fishing week. The windsurfers and kite boarders had fun with the continuing winds, but even on the few days that were fishable, the few anglers out found it less than stellar although some fish were caught. There are some quality fish around, that seem like they’re just waiting to bust loose and as winter pulls away, it’s like we two steps forward then 1 ½ steps back each week. It just doesn’t pay to get too excited. Last week, I was optimistic that maybe we were finally getting something going with some hog yellowtail, dorado, wahoo and even a tuna hookup and a marlin hook-up! These are all species we generally don’t see this early in the year. Things seemed like they were picking up! Then, Mother Nature kinda slapped us back in place. The yellowtail bite near Punta Perico and over at Cerralvo Island diminished significantly. Bait got a little harder to find…again! And overall, we were left with a smattering of dorado; some snapper; a cabrilla or two (although a few were trophy-sized) and lots of bonito. Oh, and one marlin just to keep us excited. Overall just kind of a ho-hum week, even for this time of the year. The coming week looks promising. Early, there’s some strong winds and there’s a possibility of rain, but then they really drop back quite a bit for the majority of the week. That will hopefully kick the fish up again. Thank You Long Beach Here We Come Salt Lake City! Hanging in the booth with the Secretary of Fishing and Agriculture for Mexico, Luis Andres Cordova. 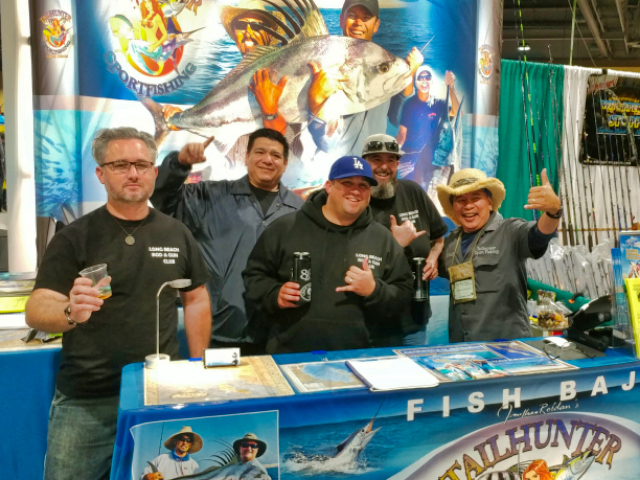 Just wrapping up a spectacular over-the-top show at the Fred Hall Fishing Show in Long Beach CA at the Convention Center. 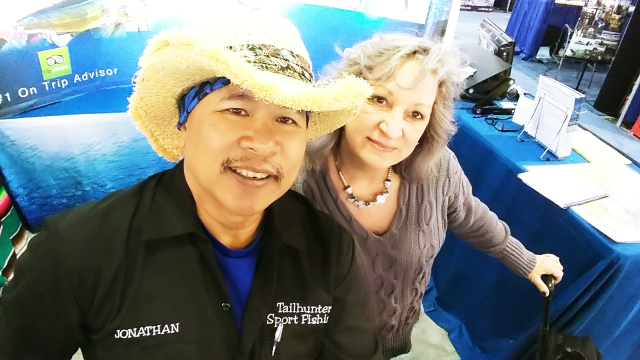 The largest fishing and boating show in the world and over 1000 vendors from all over the world packed in the crowds and Jill and I talked non-stop for 5 full days. We had a blast! 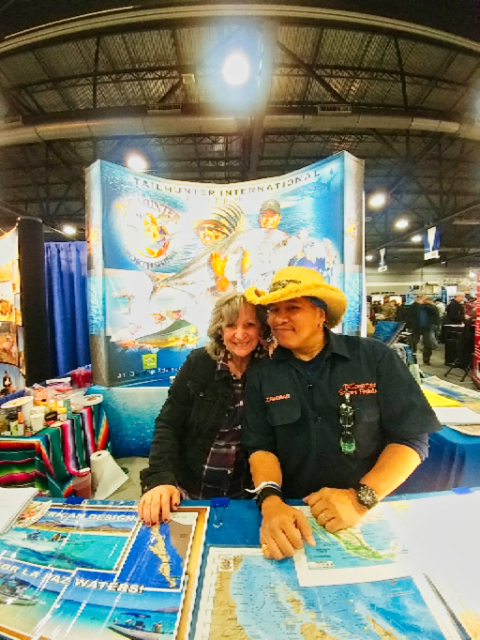 Thanks to everyone who stopped by and said hi and everyone who set up trips to see us this year in La Paz. It was a fantastic party! 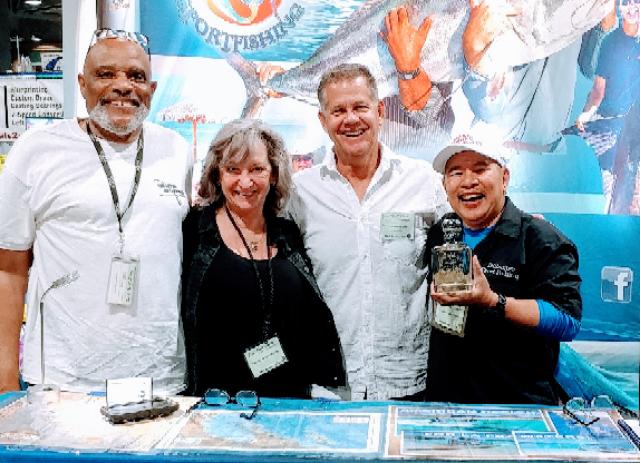 Jilly doing some socializing with Michelle from Big T’s Shirts, Carrie Wilson with Vagabundos del Mar and Rene Olinger from Baja Peninsula Tours in Loreto. Two of the best…Ed Robison from Whopper Stopper Custom Rods and Pat McDonnell retired editor of Western Outdoor News. Pat brought me a bottle of Don Julio 70 for my birthday! Can’t find a nicer guy in Dave Balthius, Vice President of Costa Sunglases and came out from Florida. 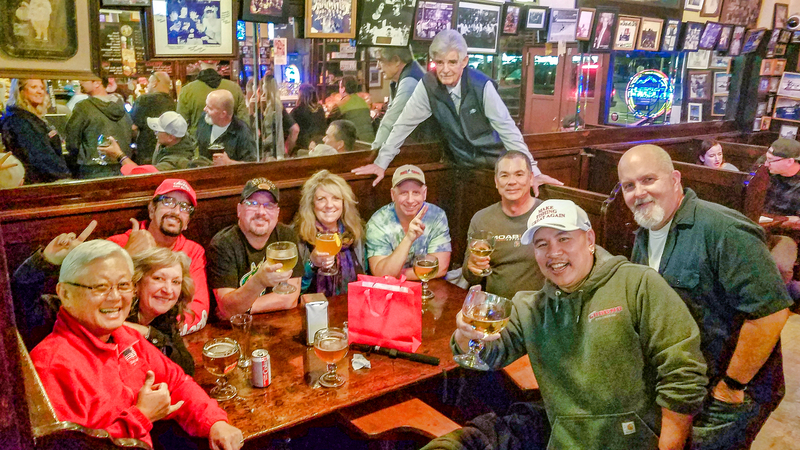 Some of the guys from the Long Beach Rod and Reel Club! But now…no rest! By the time you’re reading this, we’re in our Tailhunter-Mobile and zooming back to Utah for the International Sportsmans Show at the Expo Center in Sandy, Utah…just south of Salt Lake City. This is always a fun show and we have a ba-jillion Tailhunter amigos in the area. Hope to see you all! There’s hundreds and hundreds of vendors from everywhere from Alaska to South America and New Zealand to the Siberia! Hunting…fishing…camping…off-road…boating…there’s great things for the whole family. AND THANKS for a GREAT BIRTHDAY! I am blessed with so many great friends!